When you’re enjoying your music, the sounds of a machine shop are likely the furthest thing from your mind (unless it’s mid-career Lou Reed). Whatever your taste: jazz, classic rock, alternative – the melodies that you hear are a far cry from the dissonance of a shop floor. But there’s more than meets the eye—or the ear—when it comes to music and instruments, and behind the best music is state-of-the-art craftsmanship and technology. 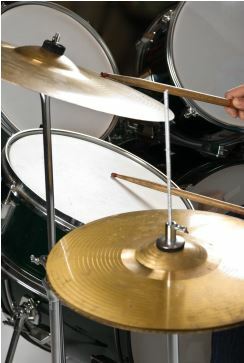 The process of metal spinning is often used to manufacture cymbals for drumsets, and some of the best known, and highest quality cymbal companies use it. Zildjian is one such manufacturer, and is one of the oldest companies in the world; they were founded in Istanbul in 1623 during the Ottoman Empire! This company, started by one man (Zildjian himself) hand-forming and hammering cymbals, now uses the modern, advanced techniques of metal spinning in the process of making their world-renowned cymbals, recognizing that the quality they expect is best met by this process. Like all of the industries and products in which metal spinning is used, it allows for perfect symmetry and uniformity of shape and form in cymbal manufacturing. Zildjian, Sabian, and other experts in sound and craft understand this. The beauty of the music created by these instruments comes in part from the skill of the company performing metal spinning before they ever reach the musician’s hands, and we at Helander are proud to engage in a process perfect for both the practical and the artistic.